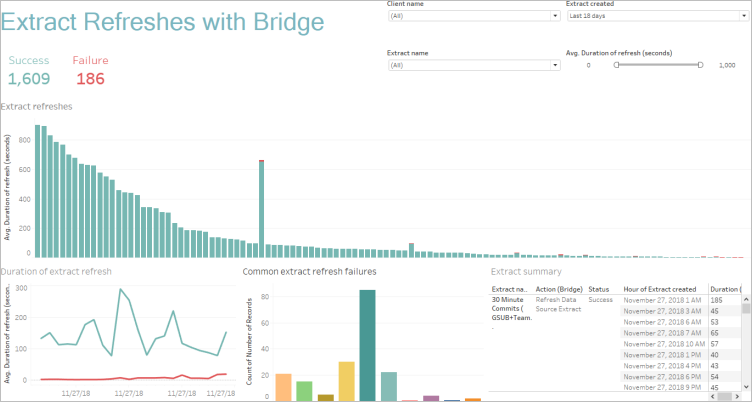 The Bridge Extracts admin view captures the last 30-days' worth of extract refresh activity by Tableau Bridge. Error rate: How often are refreshes succeeding and failing? If refreshes are failing, why? Requests made: How many refreshes are scheduled? Time-elapsed: How long are refreshes taking? Saturation: How busy is each client? You can filter the view by the Tableau Bridge client name, when the extract data source was created, the extract data source name, and the duration of the refresh. If you don't see any data in the admin view, verify that you have a Bridge client associated with your site. Alternatively, change the value for the "Extract created" filter in the upper-right corner of the view. In the "Common extract refresh failures" table, hover over each bar to see the error and the error details. If there's more than one data source associated with the error, an asterisk (*) shows instead.